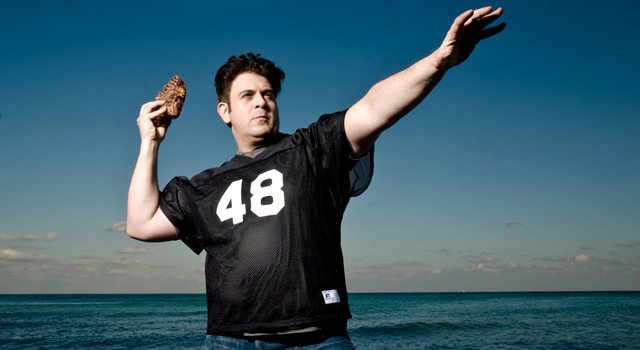 Adam Richman, host of Travel Channel's "Man v. Food" and "Man v. Food Nation," is an avid NFL fan. Adam Richman will sign copies of his book, "America the Edible: A Hungry History, From Sea to Dining Sea," at the Barnes & Noble at the Grove in Los Angeles on Wednesday, April 27 at 7 p.m. PT. Peanut butter and jelly. Bread and butter. Salt and pepper. Some things just go together. The same can be said for food and football. Seriously, what's more fun than spending a Sunday afternoon rooting for your favorite NFL teams and players while enjoying your favorite food? Well, few people know food better than Adam Richman, the host of the wildly popular show "Man v. Food" on Travel Channel. Since 2008, he has visited numerous cities across the United States while taking on some of the most iconic food challenges. While in New Orleans, he devoured 15 dozen oysters in the Acme Oyster House Challenge. On a trip to San Antonio, he tackled the Four Horsemen Challenge -- Richman had to consume a white-hot burger topped with some of the world's hottest peppers, including the "ghost chile," in under 25 minutes. In those two challenges, Man won. But Richman isn't just an expert in the culinary world -- he also knows his football. Despite his New York roots, he's a die-hard fan of the Miami Dolphins and once even sent out a tweet offering to play the same position as one of his heroes, Hall of Fame quarterback Dan Marino. Look out, Chad Henne and Tyler Thigpen. Recently, I had a chance to chat with Richman about food and football ... and which NFL players he believes would make the best competitive eaters. Adam, how exactly did you end up becoming the host of "Man v. Food?" Richman: The Travel Channel had success with their "Food Paradise" series, "10 Best Places to Pig Out" and those types of specials, so they knew there was a market for comfort food and wanted to develop a show around it. At the same time, I read this great book called "The Renaissance Soul: Life Design for People with Too Many Passions to Pick Just One," and it made me realize that food TV was something I wanted to do. So when I was told they were looking for someone who knows regional food and likes to eat a lot, I just bombarded my poor agent with email after email. It was ridiculous. I finally got the audition -- it was like a six-round process with auditions, screen tests, interviews and checking references. Finally, I got the job. We then put together a five-minute teaser trailer all around Brooklyn, but it was literally me changing clothes in bathrooms saying, "Hey, I'm in Boston," or "Hey, I'm in Philly." They picked us up, we did a pilot in Memphis and they bought 10 episodes. They knew it was something good by the third episode, so they bought eight more. By the time we shot the San Jose episode, they bought 20 more. Then it was like, we're in this for as long as you are. Take us inside the show. How do you pick the cities for each episode? Richman: To plan the cities out, obviously, you have to have the challenge. That's the point of departure. But I think we sort of over-prepare, so we will come up with 16 fully formed episodes and then try to figure out what makes the most compelling 20-episode season of TV. One of the things that we're really big on -- well, I didn't develop it per say, but I definitely had a significant role in the shaping of it (with original series producer Dan Adler) -- was to do stuff that we would actually watch. So we tried to think about what are the most iconic foods of each area. You can't do Philly and pretend that cheesesteaks or salt pretzels don't exist. Or deep dish (pizza) in Chicago or fish tacos on the West Coast. So we know that we have to incorporate those foods. And if we can find a challenge for those foods, it's all the better. You've had some pretty notable celebrities on the show. Who were some of your favorites? Richman: The fact that anyone of note has been on my show is nuts. Having Joba Chamberlain on the show and with me being a Yankees fan, that was outstanding. Joba is a great guy. If I wasn't doing the show, my dream would be to do what he's doing! But the first celebrity we ever had was Gladys Knight. I grew up listening to her, and we're all well aware of where she ranks in the world of music. That was humbling. When she was on we were nobody, we hadn't even aired yet, but she agreed to do it. That's something I'll always be grateful for because for a brand-new show to come on air with an appearance like that in Atlanta, it was just super. One of my other favorites was Alice Cooper. We showed a little bit more of the interview with him in the "Carnivore Chronicles," but he is the man. He's such a good guy. You've had some pretty monumental food challenges. Is there one in particular that was more memorable than the rest? Richman: My most memorable food challenge was probably the Big Texan in Amarillo. All the big executives called me because it was such an iconic challenge, and a victory in that would be a legitimizing device for myself as much as for the show. And as someone who competed in athletics as a kid, to know that I could do that was a very big litmus test. So here I am, sitting down with this 72-ounce steak, shrimp and a salad. It was this really carpe diem moment. You can seize the moment and to borrow from Ricky Bobby, "wrestle it to the ground like a demon cobra," or you can succumb and let the chips fall where they may. I remember there was one moment a little over halfway through the steak where I looked at my series producer, Dan, he looked at me over the monitor and said, "You got this, this is big." And taking down the Big Texan was a watershed moment. The first time you hit the food wall, the first time the protein hits your body and you get the meat sweats, the first time you realize that you're dealing with a challenge that is so recognizable that you have an obligation larger than yourself. That moment was a very big point for me. Another memorable challenge that was analogous to that was also in Texas (San Antonio). And that one I only won because of the fans. That was the difference. We shot the first 10 episodes of MvF in anonymity. No one knew who we were, what the show was, we were just this little show that could. But then in San Antonio, people were showing up with signs saying "White Lightning is my Hero" and "Adam is the Man." And all of the sudden, the obligation is deepened because it's not just about me, it's not just about my producers or anyone else who's behind the camera. Now it's about everyone who loves the show and believes in me. I think you've heard about Ben Roethlisberger talking about letting down the people of Pittsburgh (after Super Bowl XLV). Up until I've done stuff like this, that stuff was just a sound bite. But then you realize that there are these little kids who say, "How can you not have finished that omelet in Seattle?" All right, so we've talked about food. Now it's time to talk a little football. First, how exactly does a kid from Brooklyn end up rooting for the Miami Dolphins? 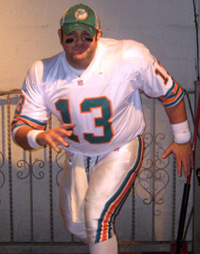 Adam Richman is a lifelong fan of the Miami Dolphins and Hall of Fame quarterback Dan Marino. Richman: Great question. My older cousin, Keith, is the closest thing I have to a big brother, and he was an amazing athlete all through his life and he dug the Dolphins. That was part of it. But ultimately the reason I'm a Miami Dolphins fan is because of Dan Marino. I remember my late father, who was the biggest football fan I have ever known, used to stress when I was younger that win or lose, you always have to compete with honor. And I remember at a young age really being struck by Marino. I always remember that if the Dolphins lost, he took it on himself. If someone else struggled, if (Mark) Clayton or (Mark) Duper didn't have it that week, or his O-line caved in and they were hitting him with blitzes like when (Mark) Gastineau was playing, he never threw anyone under the bus. And when there were moments when he absolutely was the catalyst for victory, when he would make a pass between a cornerback and a receiver that was like the size of an apartment mailbox, he always gave credit to the receivers and his line. He was always the model of dignity. Marino is also very invovled with autism because of his firsthand experience with his son. Since the good Lord has given me the opportunity to give back, I'm also very involved with autism charities. To know that Dan, a guy who played arguably the most brutal sport on the planet, has dedicated his life to knowing what autism means and help to minimize its effects, that's football spirit. Aside from Dan, who are some of your other favorite current players? Richman: I also love Ricky Williams, and I wish he had come along a decade earlier. Imagine Marino with a running game! I also met Drew Brees, and he's a real football player both on and off the field. My good friend, Bobby McCray, used to play for the Saints, and I met Brees, and you'd think he was the Maytag repair man. He was warm, kind, and gave everyone equal treatment. He even sent me a message on Twitter! There are very few players that I think hold that standard, in terms of first meeting them. Being a football fan for most of your life, what are some of your most memorable NFL moments? Richman: It's the little moments for me, like when Herschel Walker made that run without his shoe in Minnesota. It's Drew Brees kissing his son after winning the Super Bowl. It was Marino breaking the yardage and touchdown records, or Jason Witten making that run after the catch without his helmet. I also remember Eli Manning's escape against the Patriots (in Super Bowl XLII). I was at a party with a friend of mine, and I remember looking around the room at a bunch of strangers and we were all like clinging to each other and jumping up and down in disbelief. Then all of the sudden there's that (David) Tyree catch against his helmet. It was like, did Circus De Soleil draw up this play? I know you don't consider yourself a competitive eater, but what football players past or present do you think would have the most success in that role? Richman: It's weird because people think the biggest guys are the biggest eaters, but fat doesn't expand as much as muscle, so you want someone with a big frame who can expand. 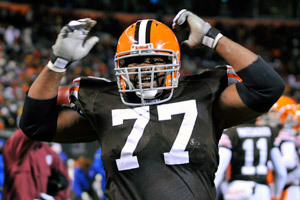 There is something about Nick Mangold that makes me think he could put down some food. Maybe it's his Viking-like appearance. He's an Ohio State boy, so with all the great food there -- and not all of it is light -- there's a lot of brats and beer and stuff like that. A guy with that size who can come off the ball as quick as he does. I think he'd be pretty good. I bet Ed "Too Tall" Jones could be a great competitive eater too. He was on of my dad's all-time favorite players, and it looked like he could jack up a toilet! Speaking of Ohio State, one of your shows was on that school's campus and showed a lot of tailgating. What are the best places to tailgate, and what are your favorite tailgate foods? Richman: When you go to Buckeye country, it is a fearsome thing to behold. I'm sure there's a great tailgating experience in Michigan, too, but I haven't been to it. The Jets fans tailgate pretty hard, I know that for sure. My friend, Dhani Jones, was playing them in New Jersey on like one of the coldest days of my life. It was a very ill-fated game for the Bengals, but that experience was pretty deep. My favorite tailgate foods are brats or Italian sausage -- they both go great with beer. They soak up just the right amount and you can still enjoy the game. And if it's quality stuff, it doesn't sit inside of you like a rock, so you can watch the game and not feel uncomfortable. So tell me about your new show, "Man v. Food Nation," which premieres June 1? How is this show different than what the fans have seen in the past? Richman: When we were making MvF in the beginning, it was me and my boys -- so we were like, let's create a food show that expresses an unbridled sense of joy. So we kept ourselves honest and I did 59 challenges. But the spectacle diminishes over time. How much of one dude doing food challenges in a half-hour format can you see before it peters out? With that said, how am I, a Jew from Brooklyn, going to know about a food challenge in Amarillo if hundreds of people hadn't attempted it before me? The idea behind "Man v. Food" was kind of me answering the call of this legend. "Man v. Food Nation" is the story about all of the people who make these challenges iconic. It's the locals. That's how the 72-ounce steak came to be -- a ranch hand said, "I'm so hungry, I could eat a whole cow. So someone said fine, "I'm going to bring out as many steaks as you can eat until you tell me to stop." That's how they got to 72 ounces. It's the locals, it's the people that are of these communities. So why keep showing me when I've done 59 of them? Why not show the college kid who did it once and wants to do it again? Why not show the guy who wants to look cool for his kids? How about the wrestler who wants to try a food challenge? We give them a chance to do it on this show. I think that's why we made the change. People are like, "Why aren't you doing the challenges?" Well I'd love to, it's fun. What's cooler than running into a room where people are rooting for you? I can't blast through a line like Barry Sanders, and I don't have a cannon arm like Marino and I don't have the feet of Roger Staubach. But we all at some point love to chow down. People are chanting your name, and they want you to win. But I'm not the only dude who should get to experience that.